So, I had a fun new craft in mind, and I went a little crazy. Couldn't stop with just making one. 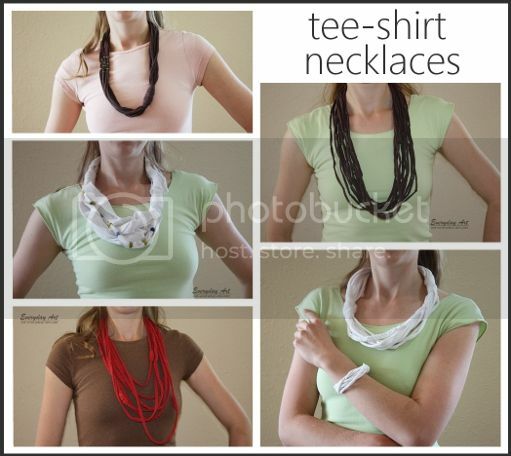 These tee-shirt necklaces were so fun to make! They were very easy, kind of a fun no-brainer craft, and yet they were also engaging and allowed for endless amounts of creativity. I had fun whipping out my old beads and rummaging through them, thinking of things I could do. I had been saving both my kids' old tee-shirts and my old tee-shirts and had lots of crafts in mind, but I'm glad I finally settled on these. I've even worn them a few times and received a number of complements on them. I think they are the perfect look for summer--kind of funky and fun, casual yet capable of jazzing up an outfit lickity-split. Have any old shirts laying around? Well, you should make yourself a necklace! (or in my case, five necklaces). 1) First, cut off the bottom hem and the top of the shirt just under the armpits, leaving just the tubal part in the middle. 2) Cut about 3/4-inch strips from one side of the shirt to the other. You can cut them completely through or leave them connected at one end as shown in the image. I did it both ways; both work perfectly well. 3) Stretch the fabric as shown in the image. 4) Embellish as desired! 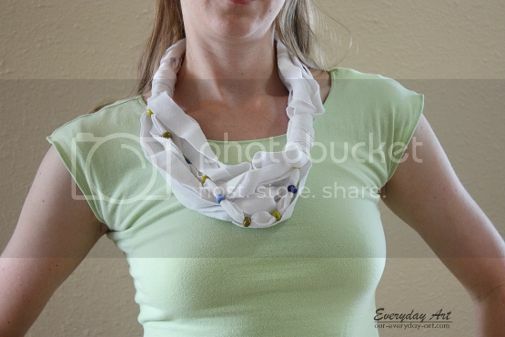 You can add beads, tie knots, cut some and braid them together, wrap scrap tee-shirt fabric around to make fabric "beads." The possibilities are endless. One "problem" I came across was the seams that are present on the sides of the shirt body. They don't stretch and curl nicely like the rest of the fabric and just plain look bad. It was a little tricky at times to hide these seems, but mostly what I did was to take scrap tee-shirt fabric and wrap it around the area with the seam. It worked well to hide the seem and it looks kind of cool. :) To secure the fabric, I used fabric glue or a good all-purpose glue. 1. 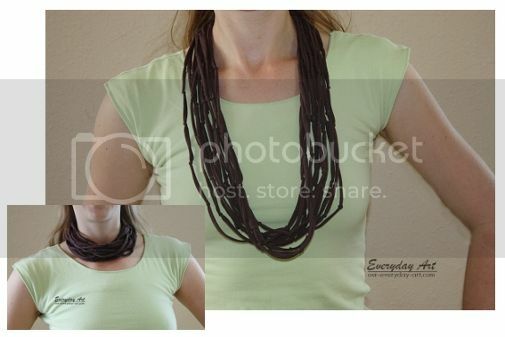 For this necklace, you can see where I hid the seems by using fabric wrapped around them (one either side of my neck). Before wrapping the seams up in the fabric though, I cut 3 strips and braided them together. I secured the free end of the braid to the seam-area of the other fabric loops with some glue and then wrapped the whole area with a piece of scrap tee-shirt fabric. 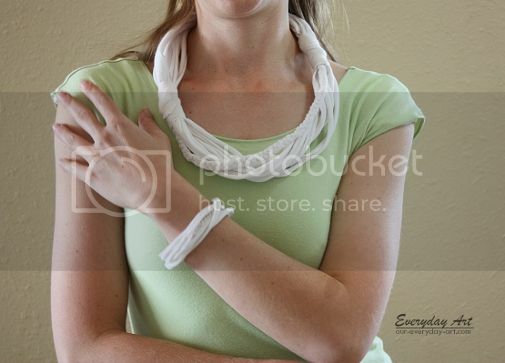 I also made a matching bracelet by using the sleeve of the shirt in the same way I did the body. 2. This necklace is one of my favorites. For this one, I use a shirt where the knit is going in the opposite direction (non-standard direction). When you cut it, it doesn't stretch so you get these wider strips that were kind of ruffly. I added some old recycled-glass beads to it. 3. This necklace was kind of fun too. You can see near the bottom where I wrapped the seams up with the scrap fabric. This time though I added these brushed-gold metal loops to the side for some variety. 4. 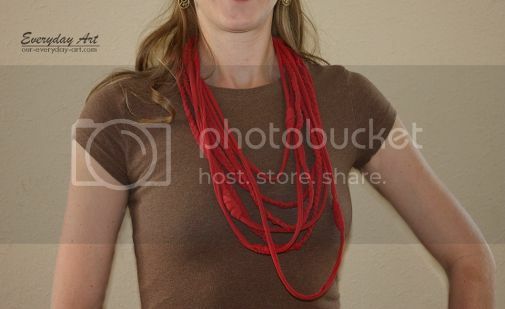 For this necklace, I tied lots of knots into each loop of fabric then tied them all together at the top. 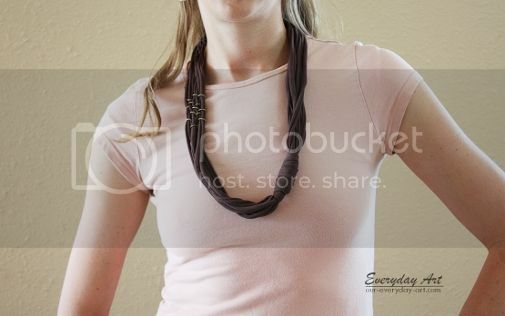 I purposely left this necklace extra long so you could wear it long or wrap it around your neck twice for a different look. And there you have it! A really fun craft to do that results in something fun to wear.